Spurt! 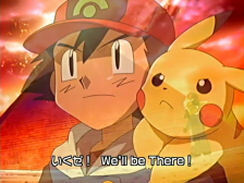 is the second Battle Frontier opening and fifth Advanced Generation opening overall..
Used in episodes AG 167 - AG ??? Ano bashou mezashi supaato kakeyou ze! Mirai no ore to no yakusoku hata sou! Honki mo honki issho ni hashirou!